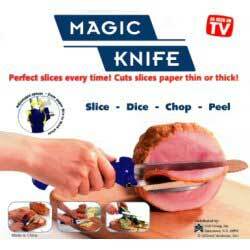 The All-Purpose Magic Knife makes slicing, dicing, and peeling easy, fast, and secure. The cutting guide can be easily adjusted to any thickness by loosening the screw on the top of the knife. Once the desired thickness is reached, simply tighten the screw again. Excellent for slicing fruits, vegetables, meats, and breads. The blade and cutting guide are made of high quality chromium stainless steel and were designed in Solingen, Germany. Dishwasher safe. Hand washing is recommended. Blade is approximately 7" long.